The green chair has sat in front of this garage door for the last year, but the computer screen has only just appeared on the scene. I haven’t worked out if there is some symbolism attached to the arrangement, as reflected in the title of this post, or random dumping. On the other hand, maybe it’s yet another Still Life of Junk as in last Thursday’s post. It’s the disposable age. Cheaper to buy new stuff now than to get the old stuff fixed. My mother (83) still owns many items she’s had all her adult life. Sad really, the way that most the majority of things are constructed with planned obsolescence in mind. I’m glad to say that my husband still gets plenty of furniture coming into his workshop to restore, as there are loads of old people living in the town who still value these original pieces. Indeed. 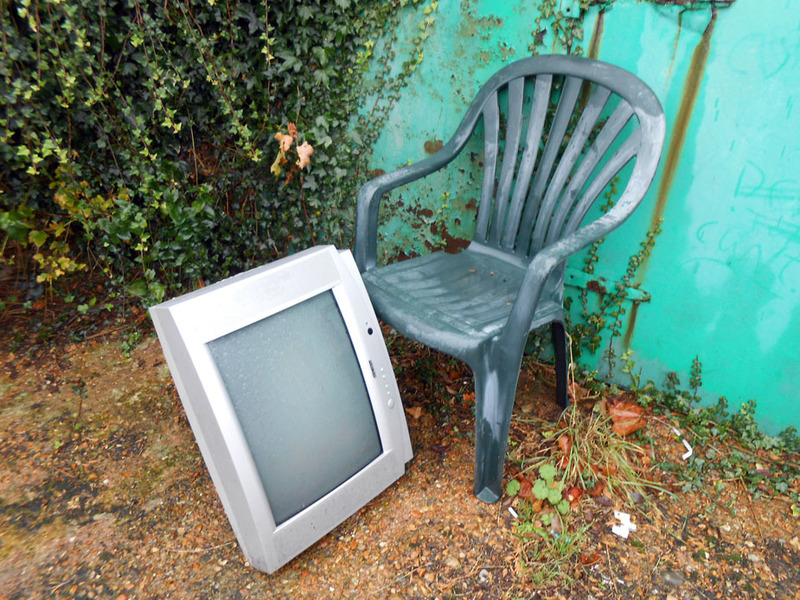 I could see no sense in that screen being dumped there, especially as it seemed to be in quite good condition. Out with the old, in with the new ever-changing technology! Yes, that does seem to be the way of things but it can get rather expensive. Also, those things that were once considered luxury items, have become today’s necessities: especially electronics. the two subjects in your previous post could sit there and watch tv!! Easily. They’re just the sort of eccentrics to do such a thing!! Previous Previous post: Wordless Wednesday — Movie Stars’ Retreat, Baa [bah] Humbug!